Our readers haven’t been short of new iPhone 6 or 5S rumors most weeks and this is thanks to an increase around this time of year, especially now that we are so close to a new generation landing at an event in September. In terms of naming, it is unlikely the 7th generation will be called iPhone 6 and the majority of leaks point towards more than one model named iPhone 5S, 5C and Lite. New iPhone 6 endurance — no matter what Apple reveals at their scheduled September press conference, you can bet there will be millions of buyers holding out for what they call a “true upgrade”. We have already seen iPhone 5 and 4S owners stating their handset is “more than enough” for their needs. These same people will grab a new iPhone 6 in a heartbeat, if it featured some major upgrades and big external design changes. The amount of new technology landing on smartphones since the iPhone 4S launched a couple of years ago is impressive, so there is a lot Apple could offer with a 7th generation iPhone but a growing number of users know exactly what they want to see with their next iPhone purchase. If Apple disappoint with iPhone 5S/5C and don’t offer a full iPhone 6 upgrade this year, then sadly a certain number of users will jump to impressive looking Android phones and give that mobile operating system a try. You can take a look at all the latest news surrounding iPhone 5S and iPhone 6 on those hub pages. You might also want to see the iPhone 5C rumors on that hub page if you’re looking for a budget version of the iPhone 5, which would likely offer a lower price tag. Personally, we don’t think a major redesign will arrive this year in the form of a true iPhone 6 update. If 2013 misses out on a major refresh, current iPhone users will need to consider their upgrade options and see if they have the endurance for a new iPhone 6 wait that could be up to 12 months away. The rumored new colors being revealed in leaks might not be enough for some people. 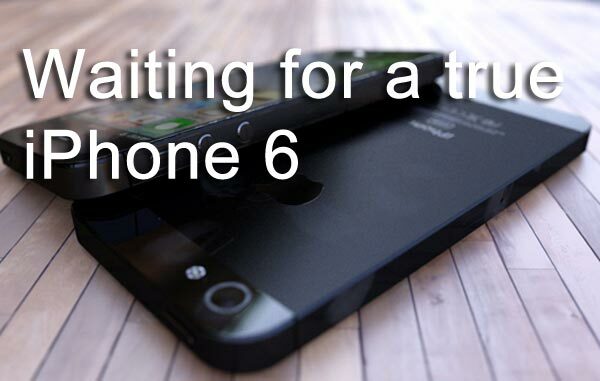 Will you be holding out for a true iPhone 6 upgrade, and do you have the patience to wait for a release date in 2014? We would also like to highlight a really interesting article that focuses on Apple and innovation, which is found on Phone Dog. It looks at how patience is a virtue and aims to explain why it might be a good idea to wait for iPhone 6, although there seems to be a clear picture being painted by some fans that since Steve Jobs passed away and maybe even longer, Apple has lost the innovative touch. The author points to iOS 7 looking to change things for future iPhones and current models, but also focuses on not much changing after many years and the author compares this to “rapid changes” with Android that some feel are more innovative of late. We have the confidence that Apple will innovate once again just like we saw 6 years ago, but they are really testing the patience of the most dedicated fans right now. If they don’t come out with a truly visionary, innovative upgrade (i.e. something worthy of being called “iPhone 6”), I’m one of the many leaving Apple products and heading for the amazing options with Samsung and HTC phones running Windows 8. Ugh.